By Nick Dearden – Global Justice Now: A landmark ruling by the European Court of Justice (ECJ) today could mark the beginning of the end of the so-called ‘corporate court’ system within Europe. This infamous system is now to be found in hundreds of trade and investment deals. Under the guise of protecting investments in foreign countries, the investor-state dispute settlement (ISDS), as it’s officially known, allows big business and super-wealthy investors to sue foreign governments for regulations they don’t like. What’s more these courts exist outside the normal legal framework, are presided over by corporate lawyers and usually meet in secret, with no right of appeal. Across the world, this system has been used to challenge dozens of environmental regulations, as well as minimum wage rises, putting cigarettes in plain packing and freezing electricity prices. It was also at the core of opposition to US-EU trade deal TTIP, which would have included corporate courts. Today’s ruling is part of a specific case involving a Dutch company called Achmea and the government of Slovakia. The company was just starting to provide health insurance in Slovakia in 2006 when a new government in the country decided to reverse the liberalisation of its health insurance market, and placed specific limits on profit-making. The case is important in highlighting the threat to contracted out public health systems – like parts of the NHS – from these corporate courts. Achmea brought corporate court proceedings against Slovakia in 2008 under a Netherlands-Slovakia investment agreement. The company won, and Slovakia was order to pay €22million. That’s when proceedings started in the German court system to force Slovakia to pay up, and the German federal court of justice asked the ECJ whether all of this was lawful under EU Treaties. 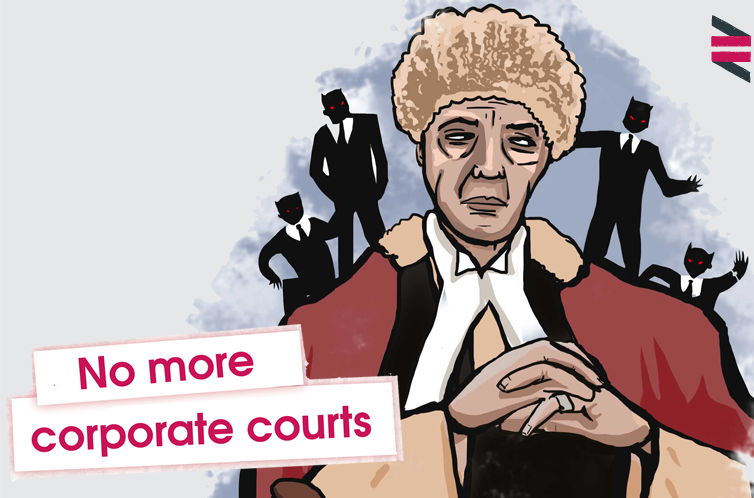 Today we received the answer: the way these corporate courts work isn’t lawful because they exist outside the normal court system and therefore outside the judicial system of the EU. As such they are incompatible with EU law. This ruling will have a big impact in a case we’ve been highlighting for a few years: that of Canadian mining company Gabriel Resources which is seeking over $2.5billion damages from Romania after it effectively rejected its plans for a gold mine –Europe’s largest – at Rosia Montana. The Romanian parliament refused to amend the country’s mining law in a way that would have made the mine possible, following months of local and national protest. Gabriel then sued Romania in a corporate court. Even more shocking, Gabriel is actually a Canadian company, but took action under a bilateral trade agreement between Romania and the UK, on the basis that it has a ‘shell’ or’ mailbox’ company registered in Jersey. We can hope that today’s ruling will end this dispute. There are around 200 intra-EU investment treaties like the two described. So this presents a massive challenge to EU member states – to revise or abandon these outdated deals. But it could have even wider implications, in that it makes it much harder for the EU to accept corporate courts in any treaties it signs – including CETA, the Canada-EU deal. Environmental lawyers ClientEarth issued a statement saying: “today’s decision marks the beginning of the end of ISDS in Europe. ISDS is not only an unwelcome tool that allows multinational corporations to put pressure on public interest decision-making, it is also incompatible with EU law. All of this takes place against a backdrop in which the corporate court system is coming under pressure globally. Not only are they central to the hold-up in full implementation of CETA, but they’ve become a flashpoint in the North American Free Trade Agreement (NAFTA) renegotiations, and have already been rejected by numerous countries from Ecuador, to South Africa to Indonesia. As it’s leaving the EU, Britain might think it can avoid terminating its investment treaties with EU member states. That’s why it’s so important that we keep pushing the British government on this issue. If the EU really is to start dismantling this undemocratic system, we can’t allow Britain to become a global laggard.